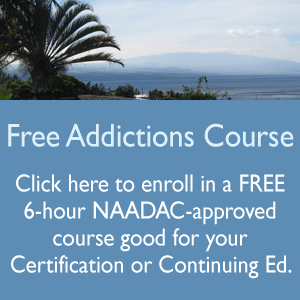 The Pacific Academy of the Healing Arts (PAHA) is an accredited provider of professional addictions training for those seeking to qualify for the Certified Substance Abuse Counselor credential, and for professionals needing continuing education credits or desiring to expand their knowledge of the latest substance abuse counseling practices. The Academy was founded in 2008 by Elizabeth Bush, MSN, APRN, CARN-AP, CSiAC, CCDP-D, and Ms. Bush continues to serve as director. The Academy’s course catalog includes the required classes to qualify you to earn the Certified Substance Abuse Counselor (CSAC) credential from the State of Hawaii, as well as a variety of courses that provide the skills and knowledge to support your success in your chosen career. The Academy delivers training via our on-line learning site,, and in-person classes that are scheduled on demand as students complete the online prerequisites. Our face-to-face classes are provided on the Big Island of Hawaii. 1. To promote excellence in clinical practice in addictions and psychiatric/mental health treatment in the Pacific islands. 2. To provide community-based state-of the-art professional education for Pacific island addiction and mental health professionals. 3. To educate the public and influence public policy regarding addictive and mental health disorders. Please refer to individual course descriptions for more specific details of each module’s goals and objectives, and content. Please be aware that each state has its own requirements for certification. Please contact us directly for a PAHA application. All courses directly relate to the five domains of assessment, counseling, case management, client education, and professional responsibility, with a specific substance abuse focus.